Dr. William E. Easterling is Dean of the College of Earth and Mineral Sciences at Penn State. Dr. Easterling has been at Penn State for nearly 15 years, serving as the Director of Penn State Institute of Energy and the Environment (PSIEE) from 2001-2007. The PSIEE serves as the central coordinating structure of energy and environmental initiatives through interdisciplinary research, education and outreach. The mission of the Institute is to expand Penn State’s capacity to pursue the newest frontiers in energy and environmental research by encouraging cooperation across disciplines and the participation of local, state, federal and international stakeholders. Easterling also serves as professor of geography and earth system science. Dr. Easterling is an internationally recognized expert on how global warming likely will affect the Earth’s food supply, and was one of the lead authors of the United Nation’s Intergovernmental Panel on Climate Change (IPCC) report on the effects of climate change. The IPCC was the co-recipient (with Al Gore) of the 2007 Nobel Peace Prize. The efforts of Dr. Easterling and other scientists were hailed for providing comprehensive and objective information to better understand the scientific basis of human-induced climate change, its potential impact, and options for adaptation and mitigation. Dr. Easterling has authored over 80 refereed scientific publications in the areas of food and climate, testified before the House Committee on Science and Technology on climate change, and chaired the National Research Council‘s Panel on the Human Dimensions of Seasonal-to-Interannual Climate Variability. 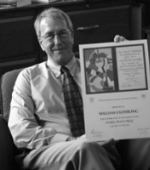 Easterling is a Fellow of the American Association for the Advancement of Science for distinguished contributions in global food availability and security through assessment of climate-change impacts, and adaptation and mitigation options.